My boss had some crafty books on her desk. She said she found them in the lunchroom across the hall. One of the people from another office had left them there and were free for the taking. So I took two. The first one is how to incorporate flea market finds into decor. It includes some lovely instructions in the back and looks like it may spark a few ideas. 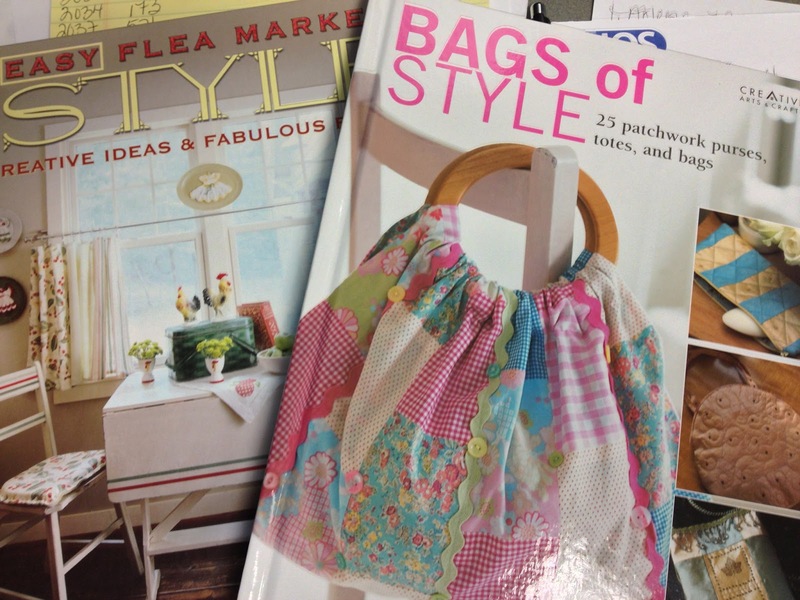 The other one is a book of purses to sew. I may have to give one or two of them a try, but tailor them to my style. 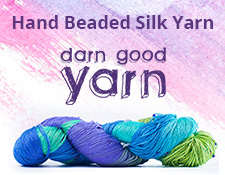 Luckily, fabric comes in all sorts of colors and patterns. When I tire of these books, they will have a home at Art of Recycle, as a way of passing them along to the next person when I’m done with them. Still, right now, yay for free books! I had gone into a local crafting store from some beading supplies, and found a panel display for parachute cord crafting, and thought, why not? Sam had been talking about it and to find it readily available at my local A. C. Moore was just a plus. I bought a kit that included some project directions, some extra cord, and was on my merry way. It’s fun to use! Not only is it utilitarian (you can use it for a lot of practical things), you make some pretty cool stuff from it. Beyond bracelets, you can make key chains, lanyards, dog collars and leashes, and use it for shoelaces. The only pain about the stuff is that you have to melt the ends after you cut it, so that means playing with fire. Kids, get an adult to fusing and melting steps. It comes in a lot of colors, besides the military grays, blacks, and greens. Lots of fluorescent colors, I noticed, which seem to be in right now. What I have done here as an example are two bracelets, both done in what is called the cobra stitch. The first is a two toned cobra stitch bracelet with a plastic clasp. The yellow one is a single cobra stitch with a Celtic knot and loop closure. 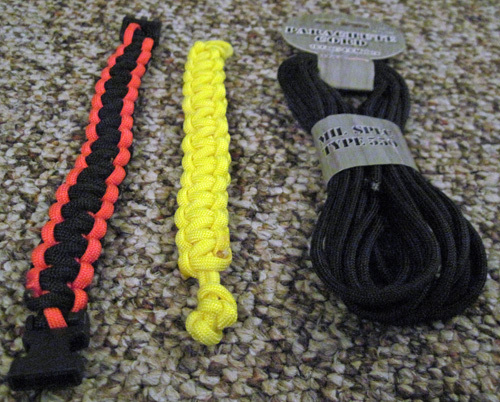 Beside the bracelets is an example of the parachute cord. For more information about parachute cord crafting, check out the Pepperell Braiding Company’s web site. Looking around, you can also buy this stuff in bulk and there are a ton of other patterns out there. I will be doing that myself. My crafting life needs to get back to a more relaxed pace as it was before Christmas. I want to start another sweater. I want to knit hats for the local cancer center. I want to find something really nerdy and knit it. I need a rest from the frenetic pace I had gotten caught up into since Christmas, knitting things for gifts and for the Snowflake Gala. Right now, I have a hat started for the cancer center, and am working on a lacey spiral scarf that I am so keeping for myself. Even though I have a few orders for knitted items, I will get them done, but I need to relax with my needles and do something for myself. Selfish? Perhaps. I need to take care of myself right now. And that’s what I am going to do. I also need to get back to you, my dear readers! I know I haven’t been blogging as much as I would have liked, but life caught up with me, as it has habit of doing. So, in the next few days, watch for some new updates and some lovely things! I am going to do my best to get back on track. One DIY site that I always forget is Instructables. I have found some interesting stuff there. I haven’t posted any of my own istructables, but I hope so soon. In the meantime, I encourage you to take a look at Instructables and its many offerings. You can find instructions on anything: from food to relationships, to sewing to technical gadgets. It’s fun! Learn something new and perhaps contribute something yourself. In the meantime, here are some of my favorite Instructables. Go and learn something new!